Celebrate the 100th Anniversary of the Pulitzer Prizes! Join the 2016 Reading Challenge to read 5 books in 5 months – Lovely, Dark, Deep by Joyce Carol Oates, The Plague of Doves by Louise Erdrich, Beloved by Toni Morrison, The Stories of John Cheever, and The Brief Wondrous Life of Oscar Wao by Junot Díaz – and take part in reading discussions as we explore Pulitzer recognized works of fiction deemed among the very best by Pulitzer Prize judges. 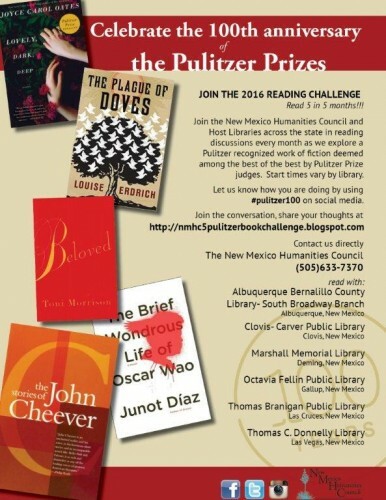 So, start reading and join the conversation, sharing your thoughts on the New Mexico blog Pulitzer Dialogues. You can also participate on Twitter, Facebook or Instagram using #pulitzer100. Additionally, six New Mexico libraries across the state are hosting reading discussions every month – Marshall Memorial Library in Deming, Thomas Brannigan Public Library in Las Cruces, Clovis-Carver Public Library in Clovis, Octavia Fellin Public Library in Gallup, Thomas C. Donnelly Library in Las Vegas, and Albuquerque Bernalillo County Library-South Broadway Branch. Social Media for Library Advocacy: Tumblr! got a couple of hours to spare?